I'm asking in relation to a previous post I made: To be clear, I am in no way trying to contest whether it should have been locked or not. However, being new to the site and eager to correct my mistakes, I saw a misleading message indicating that if my question could be reworded to better fit the criteria prescribed through the guidance in the help center then I should edit the question. Clicking "edit" on the question results in a message showing "Post is locked". If the message appears as a result of the post being locked, why does it suggest a corrective action it inherently does not allow? Or is it that I botched my question so badly that it's been judged as completely irreparable? In relation to the subject of posts that have been locked, I would also like to make a feature suggestion that would be more conducive to educating posters like myself in this example case and also potentially beneficial to moderators and their peers. In my industry (food safety), when we tag and file a non-conformance report, one of the most important fields we fill out is "Reference to Standards". This field serves two intentions: 1) if there is a person or function related to the cause for the NCR, they can review and more easily conceptualize why their action(s) were deemed as a non-conformity, and 2) where there is any ambiguity or interpretation of the official code/guidance itself, the citation would make it easier for subsequent peers or auditors to follow the chain of reasoning that led to the initial decision. Obviously, in the case of my workplace potential ramifications are much more severe; however, in browsing through various posts here I've noticed people seem to often be in the dark regarding the specific details as to what happened and why. From my perspective as a new user, there's also an unsettling feeling of finality that brooks no rebuttals; again, I don't mean to imply any doubt as to the validity of the moderators' decisions, but rather in consideration of how the site espouses the exchange of knowledge, I feel that sentiment should extend even to corrective and preventative activities conducted by its community; from a macroscopic/systemic perspective, the resultant awareness that's propagated from such transparency might potentially reduce the amount of redundant labor moderators spend on a) similar future infractions that could have otherwise been mitigated, and/or b) subsequently having to explain or justify their decision-making. Just food for thought! [Is] it that I botched my question so badly that it's been judged as completely irreparable? Your question was originally posted on Android Enthusiasts Meta. Being off-topic to meta site, and assuming from the screenshot and the rest of the body of the post, I deemed it on-topic to the main site and migrated it there. This cross-site migration automatically results in the post getting closed as off-topic on the originating site, which is meta in this case. On the main site, I exchanged comments with you to seek clarification. 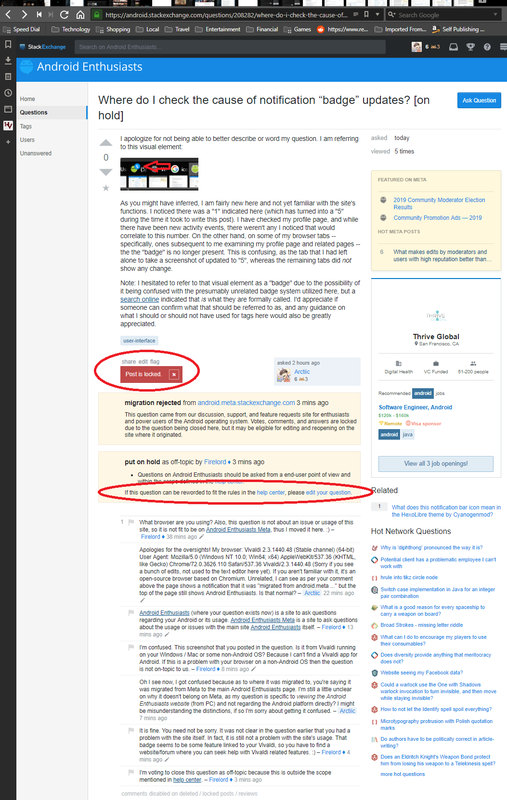 Post that, I evaluated that your post is not on-topic to our main site as well. Therefore, I closed the post there too. Now, whenever a migrated post is closed on the destination, it is deemed as rejected by the destination site, which is the main site in this case. A rejected post is automatically locked by the system, and only Moderators can unlock or edit a locked post. I feel sorry that you had a hard time here, but I only acted in the best interests of this site. If you feel that the system should not lock the question on the destination site for reasons you have given in your post, I suggest you take up your case on the Meta Stack Exchange because the software that powers our site also powers most of the sites in the network. Any modification would have ramifications for a majority of the sites in the network.